The study was carried out by Stanford Woods Institute for the Environment, the Stanford University's hub of environment research, and published in the latest issue of Nature Climate Change. It also found changes in the atmosphere like winds and moisture which are likely to be responsible for changes in wet and dry spells. They have also found that there is substantial variability within the monsoon season, including fluctuations between periods of heavy rainfall (wet spells) and low rainfall (dry spells). "These fluctuations can cause extreme wet and dry regional conditions that adversely impact agricultural yields, water resources, infrastructure and human systems," the study said. 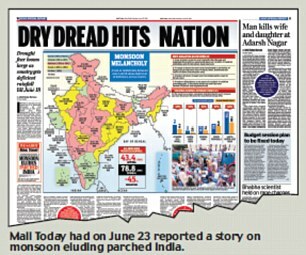 According to the study, the mean rainfall during July-August shows a significant (10 per cent significance level) decreasing trend since 1951 over the monsoon "core" in the data set of the India Meteorological Department (IMD) which is consistent with reported decrease in all-India rainfall. This decrease in mean rainfall occurs despite an increase in seasonal mean low-level moisture convergence and convective available potential energy expected from increased moisture availability in response to atmospheric warming. In contrast, the daily rainfall variability during July-August shows a statistically significant (5 per cent significance level) increasing trend. The study revealed that the intensity of rainfall in wet spells during 1981-2011 was significantly higher than during 1950-1980. At the same time, dry spells became 27 per cent more frequent during 1981-2011, which had twice as many years with three or more dry spells. 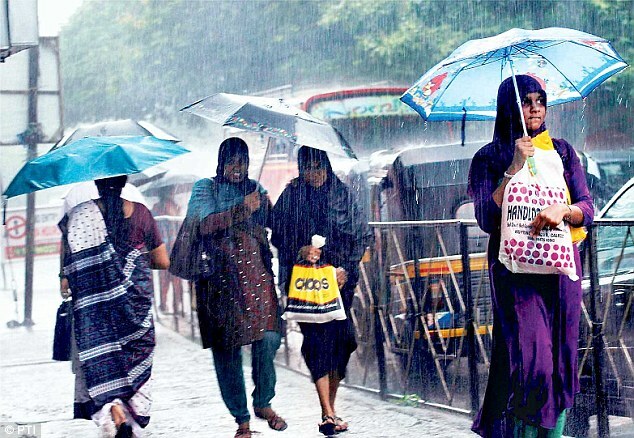 Studying the pattern of monsoons in South Asia since 1980, researchers observed an increase in the intensity of wet spells and in the frequency of dry spells. "Through a comprehensive statistical analysis of precipitation observations (1951–2011), we show that statistically significant decreases in peak-season precipitation over the core monsoon region have cooccurred with statistically significant increases in daily-scale precipitation variability," the researchers said. The study said the changes in extreme wet and dry spell characteristics are supported by increases in convective available potential energy and low-level moisture convergence.